So while, I’m always on the look-out for new Vitamin C products, last month I got a chance to try Super C Vitamin Strong Serum from IQ Natural Skincare. Learning, it contains 20% L- ascorbic acid along with vitamin E and Ferulic acid, I knew at once, this is the one – even if it crushes my bank! After cleansing and toning apply a small amount to areas you would like to treat then apply moisturizer over the top of the serum. Water, Ethoxydiglycol, L-Ascorbic acid, Glycerin, Caprylic/Capric Triglycerides, Ascorbyl Palmitate, Laureth-23, d-Alpha Tocopherol, Ferulic Acid, Resveratrol, dl-Panthenol, Glutathione, Glycine and Proline and Hydroxyproline, Sodium Hyaluronate, Cyclopentasiloxane and Dimethicone/Vinyl Dimethicone Crosspolymer, Palmitoyloligopeptide and Palmitoyltetrapeptide-7, Epidermal Growth Factor(EGF), Cetyl Esters, Hydroxyethylcellulose, Triethanolamine, Diazolidinyl Urea and Iodopropynyl Butylcarbamate. 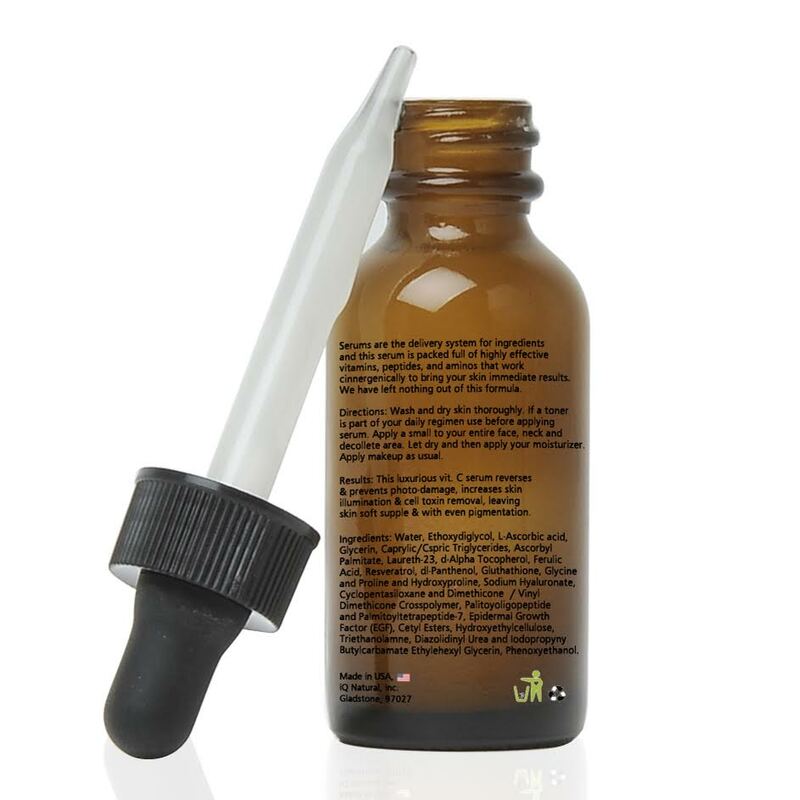 The anti aging vitamin C serum comes in a dark glass bottle with a dropper. I press it on the top to fill ¼ of the dropper with the product to use it all over my face and neck. It has a gel like consistency, which is neither thick and nor runny like other vitamin C serums in the market (most other vitamin C serums I’ve tried in the past had water-like consistency). Also, the serum has a slight orange tint to it. Not sure, if the color is due to the presence of Resveratrol in the serum or because the product was oxidized by the time I opened it! Thankfully, latter could not be the case because I can see the serum working for me. But either way, I don’t like the idea of colored vitamin C serums because you can’t make out when the product gets oxidized. I hate products that leave you with a sticky and oily face. But fortunately, this Vitamin C serum sinks in quickly without leaving any greasiness or sticky residue. As for the scent, it’s slightly citrus, slightly medicinal – well that’s what I could make of its highly faint fragrance as far as I dig. The product says to use a moisturizer after applying this serum. But I don’t feel the need for it as the serum is extremely hydrating. The texture of my skin feels softer and suppler after I use this serum. It’s been over four weeks, I’m using the serum diligently in my morning and evening care routine and I can notice this serum has made my face look so much smoother and even toned. I was battling with dullness, dark spots, and patchiness ever since the arrival of this summer and must confess, this serum has helped in addressing all these issues. Okay, the improvement is slow compared to the quick and drastic results I was expecting. Because after all, no matter what any product claims and no matter how powerful the ingredient list, there is no substitute to cosmetic procedures done at a dermatologist’s office, when it comes to transforming ageing skin or lightening dark, dull skin. Yet there are few ingredients like retinol, AHA, vitamin C, vitamin E , etc. , that do promote collagen formation, fade fine lines and brighten dull complexion when used meticulously overtime. And the good thing about this strong vitamin C serum is that all the powerful proven brightening and anti aging actives such as L-ascorbic acid, vitamin E, ferulic acid, resveratrol, glutathione, hyaluronic acid etc. come at the beginning of the ingredient list, making this serum one of the most potent and best vitamin C serums in the market. So, while the dullness of my skin is replaced by a fresher, brighter, and more even toned complexion, I’m now expecting the real deal to come after 3 or 4 months, when I’m hoping my skin to show maximum progress and I can compare the results to an in-office chemical peel or other cosmetic treatment (keeping my fingers crossed until that time)! Contains 20% L-ascorbic acid, which is the highest concentration of vitamin C I have used in a topical product so far! Priced at $ 89 for 30 ml, I must say its exorbitant price is a HUGE con. But the fact that you only need to apply a few drops each time, you do get a lot for your money. And for the results it has given me, I’d pay for it even if that means crushing my pocket every time I re-purchase..
20% L-ascorbic acid is too high. It’s a positive as well as negative. If your skin can adapt to such high concentration, it would work like a charm but if you’ve got sensitive skin, you better stay away from this product. It would only damage your skin. Thicker consistency compared to other water-like vitamin C serums in the market. May not suit acne-prone or oily skinned beauties. On the whole, this super C strong Vitamin Serum by IQ Natural is one of best anti aging and skin brightening serums in the market with 20% L-ascorbic acid along with Ferulic acid and Vitamin E. It’s rare to find an anti aging or skin brightening product that lives up to its claims. But I wish it were cheaper and non-tinted. Also, because it contains the highest concentration of Vitamin C, I don’t recommend it to girls with oily or sensitive skin. I am 31, can I use vitamin c serum specially for crow’s feet . How about dr. Reddy vitamin c serum…read good reviews about it. Hi Saloni. Yes, you can use Vitamin C for under eye area but as per my research Vitamin K works best for this area. 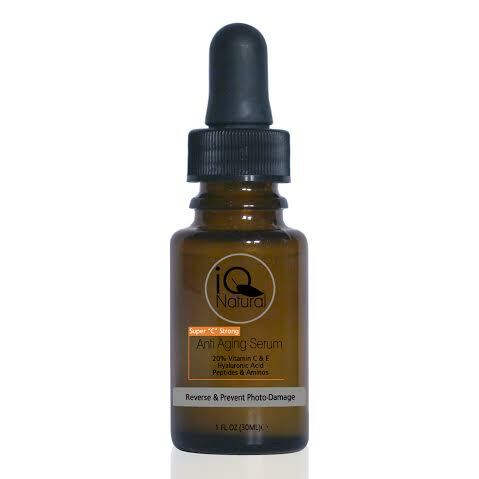 IQ Natural offers a great Vitamin K serum. Ega cream also contains Vitamin K in its formulation. As for Dr. Reddy Vitamin C, yes, it’s a good one to purchase. Also which under eye cream is better for dark circles and crows feet…ega or eyelite? Eyelite is a better option anytime, if you’re looking to fade dark circles. Yes, it also works on puffiness, crows feet and under eye wrinkles. Hi mam, neither I could find dr reddy vitamin C serum nor vitamin K serum IQ naturals. I have dark circles and crows feet both but crows feet is a major concern. Pls suggest any eye cream or serum best for this. I have been using sebamed q 10 under eye cream but it didn’t help much. Also I am fair, have very dry skin and have been noticing small spots on my face, for removing this and for an even toned and fair complexion , I wanted to use vitamin C serum, what is the next best option after dr reddy? Hi Saloni. For dark circles and crows feet, you can use Kaya skin clinic brightening and firming eye serum along with Brightening serum by the same brand for even toned and radiant complexion. As for vitamin C serum, you can use either of the Auriga Flavo C serum or cipla vc 15 serum. All the best. This one is better than Auriga anytime because besides 20% L-ascorbic acid (highest concentration) this super C vitamin serum contains other powerful proven anti aging ingredients such as Ferulic acid, Hyaluronic acid, Resveratrol, Glutathione, dl-pantethenol, and peptides. If your skin can take 20% L-ascorbic acid, then nothing like it. Ok, this means it is better to start with low dose like auriga then shift to iq 20? Ho Saloni. Go with the first option. It’s a fortified vitamin c serum containing powerful antioxidant Gingko Biloba for enhanced protection. Hi Keeru. Most skin lighteners are known to cause skin sensitivity. If your skin is already sensitive, I would suggest you to stick to safer organic options. But if you really really want to use then learn to play safely. Use them sparingly in very very small quantities only in the evening and be extremely strict about your sun protection in day time while using lighteners. You can start with Demelan cream in the evening only on dark spots. Let it stay for two hours and then wash off. After that apply Melaglow cream in the night again on dull pigmented areas of the skin under your regular moisturizer or night cream. Don’t Ega cream, while using these creams. Or you can skip Melaglow cream if you are already using Ega cream as night cream. For under eye area, you can try using Avarta under eye cream for fine lines. Hope this helps. All the best. Hi Keeeru. Avene triacneal would be a better choice than Epique. If you want to take a break from Ega, you can go for Avene. Hi Keeru. Good to know, you have made your switch to organic products. They are slow initially but overtime going organic proves to be more effective and wiser option. Forest Essentials and Kama Ayurveda are two very good brands with highly amazing product range. As for a safe Vit C serum for sensitive skin, I would suggest you use Antox C vit c serum by Kaya Skin Clinic. Thought not that concentrated, it’s the safest bet among all. Hi anshu,as per your advice i used auriga c serum,worked great on my skin which is oily. Shall i buy same one again or switch over to some other brand of serum?